Hyperion Books for Children, 9781368013529, 32pp. 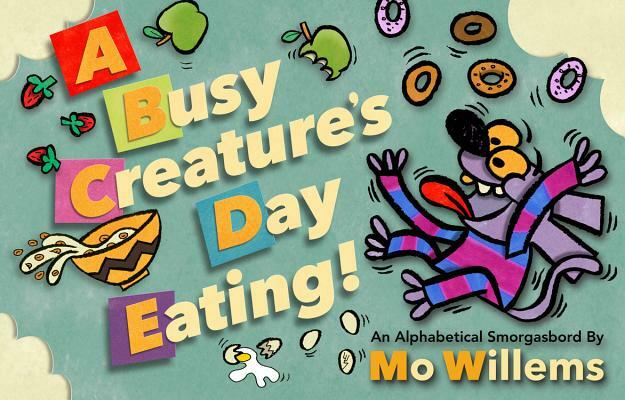 Mo Willems delivers a smorgasbord of hunger, hubris, regret, and redemption as a Busy Creature hilariously chomps and chews its way from A to P and then to Z.
Mo Willems (www.pigeonpresents.com), a number one New York Times best-selling author and illustrator, has been awarded a Caldecott Honor on three occasions, for Don't Let the Pigeon Drive the Bus!, Knuffle Bunny: A Cautionary Tale, and Knuffle Bunny Too: A Case of Mistaken Identity. The celebrated Elephant & Piggie early-reader series has been awarded the Theodor Seuss Geisel Medal on two occasions (for There Is a Bird on Your Head! and Are You Ready to Play Outside?) as well as garnering five Geisel Honors (for We Are in a Book!, I Broke My Trunk!, Let's Go for a Drive!, A Big Guy Took My Ball! and Waiting Is Not Easy! ).